I've recently had several requests for a Plague Doctor's mask, and as it appeals to my sense of beauty I've begun working out a pattern. 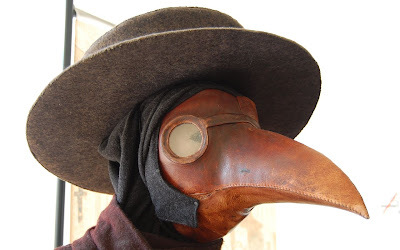 I particularly like this one shown above (which resides in a Danish museum) as inspiration, because the beak flows gently from the face, rather than looking just stuck on. Unfortunately it does have a major flaw in that the eyes are too widespread, and the wearer would scarcely be able to see out of it. This is my first attempt, with corrected eye placement. I'll be adjusting the pattern in a couple of places and trying it again. oooh - looking good so far! 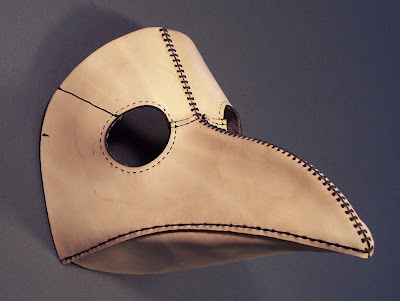 I was (and still am) very excited when you told me you were making a Plague Doctor mask. I look forward to buying one from you. The eyes being unusually wide is probably to make the person wearing it feel more like a bird haha turning your head to see..